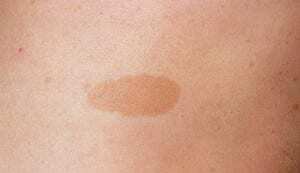 Birthmarks are common flat or raised skin discolorations that are present at or appear shortly after birth. They may present as red and vascular lesions or as pigmented patches of the skin. The most common red and vascular birthmarks are hemangiomas, port-wine stains, and salmon patches (“stork bites”). The most common pigmented birthmarks are moles, cafe-au-lait spots, and mongolian spots. Most birthmarks are harmless but sometimes they may be associated with other health risks or problems. Treatment options depend on the type of birthmark, location, associated symptoms, and risk factors. They include observation, medical therapy, surgical removal, and/or laser treatment. In addition, birthmarks that exhibit changes such as bleeding, color change, inflammation, itching, ulceration, pain, or change in size and texture should be examined.